THE MENORAH, A SYMBOL OF THE JEWISH PEOPLE AND THE OFFICIAL EMBLEM OF THE LAND OF ISRAEL. Shalom. Our teaching this morning will continue from GOD’S eternal Torah, GOD’S Laws, Teachings, and Instructions that are written in The Law of Moses. And the title of our teaching is THE MENORAH, A SYMBOL OF THE JEWISH PEOPLE AND THE OFFICIAL EMBLEM OF THE LAND OF ISRAEL. And with that said, let’s read Numbers 8.1-4. NUMBERS 8.1-4 The LORD spoke to Moses saying, speak to Aaron and say to him, when you light The Lamps, The Seven Lamps will give light in front of the Menorah. The Menorah is the seven branch candelabrum. And Aaron did so. He lit the Menorah as The LORD commanded Moses. EXODUS 27.20-21 GOD commanded that the Menorah was to be placed in the Tabernacle Sanctuary outside the veil where inside the veil was the Holy Of Holies that contained The Ark Of The Covenant with the Two Cherubim on The Lid which is The Mercy Seat. And the Menorah lamps burned continually. Aaron and his sons, and the Priests after them lit the Menorah, having pure beaten olive oil in the lamps, every evening and morning for the Menorah to burn continuously. It is a Statute forever when there is a Temple in Jerusalem. The Seven Candlesticks in this setting, Messiah said, represent the seven Congregations that had faith in The Messiah Yeshua. These Congregations could not have been Churches because Constantine created the first Church in the early 300’s C.E. (A.D.). This event with the Disciple John took place around 90 C.E. (A.D.). Thus, the seven Churches were in fact seven Congregations of people who believed in The Messiah Yeshua. Some of those people were Holy and GODLY, while others were not. And The Messiah Yeshua commanded a number of those Congregation Leaders and others to repent. Repentance then, and repentance today is the same. Many have their beliefs for what The Seven Candlesticks of the Menorah represent. I have my belief also. GOD’S Perfect Fullness. His Supernatural Love. His Unlimited Power. A list that goes on and on that is so far beyond human knowledge includes THE LORD SPEAKING THE CREATION INTO EXISTENCE. AND THE ONE GOD SPEAKS TO GOD WHEN THERE IS ONLY ONE GOD. AND GOD BEING IN DIFFERENT PLACES PHYSICALLY AND SPIRITUALLY ALL AT THE SAME TIME. FOR EXAMPLE, GOD IS IN HEAVEN AND ON EARTH AT THE SAME TIME. YET THERE IS ONLY ONE GOD. AND GOD THE FATHER, AND GOD THE SON, AND GOD THE MESSIAH, AND GOD THE SPIRIT, AND GOD THE HOLY SPIRIT ARE ALL ONE AND THE SAME, THE ONE GOD OF CREATION. A virgin giving birth to a man child Who is in fact GOD, GOD The Father, Ha Shem, The Messiah Yeshua is for GOD every day life. For us it is miraculous. GENESIS 1.26 GOD IS AN US. And there is Only One GOD. The One GOD is an Us because GOD is The Father. GOD is The Son of GOD. GOD is The Messiah Yeshua. GOD is The Spirit, and GOD is The Holy Spirit. All are One and The Same. And GOD is so much more. Thus The Seven Candlesticks of the Menorah that GOD Himself designed might represent His perfect fullness of His perfect greatness that is beyond human knowledge. Beyond human understanding. But GOD tells us all we need to know about Him when He commands all Mankind to do the Words of His Law, The Law of Moses. And that includes believing in Messiah Yeshua Who is Elohim, Who is The Torah, Ha Shem ,The Holy One Of Israel, Who is our Atonement, The Holy Spirit and The Spirit DEUTERONOMY 29.29, GENESIS 1.1, ECT. Let’s return to The Menorah The Seven Branch Candelabrum. The Menorah is a symbol of The Jewish People, and the official emblem of The Land Of Israel. The Menorah was adopted as a symbol of The Land Of Israel when Israel was reborn in May 1948, and it became one of the most familiar Jewish symbols. The official flag of Israel represents the Land of Israel, its sovereignty, self rule, self government, self determination, and freedom under GOD, under His Torah. The flag of Israel not only represents the citizens of Israel but all the Jewish People worldwide. The blue star of David in the middle of the flag with a white background has two horizontal blue stripes that represent a tallit, or a prayer shawl. And the white between the two stripes represents the Red Sea that GOD split for The Children Of Israel to cross on dry ground when they left Egypt in the Exodus to journey to the Promised Land. The flag was first adopted as the flag of Zionism at its inception in 1896, and chosen as the flag of the sovereign State of Israel on October 28, 1948 five months after Israel was declared an independent nation. The Star Of David, or as many Jewish People call it the Jewish star, represents Jewish identity, as the cross represents Christian identity. 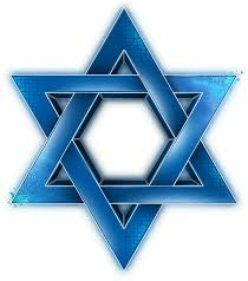 The star of David also represents The Jewish People and Jewish culture, and 4,000 years of Jewish history. And the Land of Israel. All born from Abraham and Sarah, and Isaac, Jacob, and Jacob’s twelve sons, the fathers of the twelve tribes of Israel. The Star Of David spread from Jews in Europe to the Jewish People in Muslim lands. And virtually no Synagogue is without representation of the magen David that means the shield of David. The Nazis used The Star Of David on the identifying badge the Jewish People had to wear throughout Europe. The Jewish People are an Eternal People along with non-Jewish People who have faith in Messiah Yeshua and walk in the ways of GOD keeping His Law of Moses. Salvation comes from the Jews who wrote the entire Bible from Genesis through Revelation that contains all GOD’S Laws, Teachings, and Instructions for Salvation. That is to say, all Mankind must live by every Word that proceeds out of The Mouth Of GOD for Salvation. That includes GOD’S Law Of Moses. Believing that there is Only One GOD. And Yeshua The Messiah is that ONE GOD. And that Yeshua The Messiah is your Atonement for the forgiveness of your sins. That is Salvation. Thus, Salvation is from The Jews who received GOD’S Teachings for Salvation, and wrote those Instructions in the Bible. That Gospel that is taught in The Bible, for the most part, is not preached today. Zionism means the return of the Jewish People to its own Land, The Land Of Israel, and the resumption of Jewish sovereignty over the Land of Israel that GOD has given to His Jewish People for an everlasting possession. GENESIS 17.7-8. The name Zionism was conceived by Nathan Birnbaum in 1890. And Theodor Herzl became the head of the first Zionist Congress in Basel, Switzerland in 1897. And there he established The World Zionist Organization. The Land of Israel is poetically called Zion. The return of the Jewish People to Israel is deeply ingrained in Jewish religious thought. The dreams of the exiles in Babylon to return home. The dreams of the Jewish People are also expressed in the Psalms, and The Book of Ezekiel in prophesy after the destruction of the second Temple. Our return to our Homeland Israel became imprinted in all forms of religious expression. Jews turned to Jerusalem in prayer. Their prayers continuously appealed to GOD to return His people to their homeland, and rebuild the Temple. Jewish prayers in the Diaspora, Jews living outside of Israel, prayed for The LORD OUR GOD to return us to our homeland, The Land of Israel. Jewish poems often turned to Zion. And at the end of the Passover seder, many say, Next year in Jerusalem. Zion was originally a Jebusite hill fortress in southern Jerusalem that was conquered by King David and named The City of David. As the City expanded to the north, Zion also marked the site of the Temple that was built by David’s son Solomon. The Prophets speak of Zion as the entire Jewish Kingdom that is The Land of Israel from the River of Egypt to the Euphrates River. Or the People of Israel. Zion is also spoken of as a forsaken spouse, and the Jewish People in distress. While in prophecies, Zion is mentioned as redeemed by GOD, and the mother of reborn Israel. Modern Zionism emerged at the end of the nineteenth century as a political movement, and only a small minority initially embraced Zionism, the return of the Jewish people to their own homeland, The Land of Israel. But the holocaust virtually silenced the opposition to Zionism. And GOD has answered Jewish prayers with the return of millions of Jewish People to Israel in 1948 after the second World War. And many more Jewish People continue to make aliyah, moving to Israel and becoming a Citizen of Israel. And yes, all our prayers will be answered at the return of Ha Shem, Yeshua The Messiah to establish universal peace, and restore all the Jewish People to their homeland, The Land of Israel. And The LORD YOUR GOD, The Messiah Yeshua will be in the midst of us. He is mighty. He will Save. His will rejoice over you with joy. He will rest in His love. And He will joy over you with singing. ZEPHANIAH 3.17. AND KNOW THIS, YESHUA THE MESSIAH IS HA SHEM, THE HOLY ONE OF ISRAEL. Posted on February 28, 2016 February 28, 2016 Categories Shabbat MessageLeave a comment on THE MENORAH, A SYMBOL OF THE JEWISH PEOPLE AND THE OFFICIAL EMBLEM OF THE LAND OF ISRAEL. WHY WILL GOD REINSTATE THE ANIMAL SACRIFICE IN THE ONE THOUSAND YEAR MILLENNIUM DURING THE DAYS OF THE KINGDOM OF GOD ON EARTH IN ISRAEL? Shalom. Our teaching this morning will continue from Torah, The Law of Moses. The verses of study will be Numbers 7.1-11, 84-89. And the title of our teaching is, WHY WILL GOD REINSTATE THE ANIMAL SACRIFICE IN THE ONE THOUSAND YEAR MILLENNIUM DURING THE DAYS OF THE KINGDOM OF GOD ON EARTH IN ISRAEL? And with that said, let’s read Numbers 7.1-11, 84-89. But for the past 1,946 years without a Temple in Jerusalem, it is not lawful to sacrifice animals because The LORD says in Torah, The Law of Moses, “Any person from the House of Israel, or the strangers who live among you that offers a burnt offering, or a sacrifice, and does not bring it to the door of the Tabernacle of the Congregation (later the Temple) to offer it to The LORD, even that person shall be cut off from among his People.” That meant death to the disobedient. Thus as we all know, there is no animal sacrifice today for atonement. But GOD knowing the end from the beginning, and everything in between, knowing that the Romans would destroy the second Temple in 70 C.E., Messiah Yeshua, thirty-seven years before the second Temple was destroyed, accomplished what He came to do in Israel at His first coming 2,000 years ago. He gave His Life, and shed His blood to make Atonement for His Jewish People and all who receive Him according to GOD’S Eternal Law of Moses. The Righteous of GOD, those who have Atonement in Messiah Yeshua, and live their lives according to GOD’S Eternal Law of Moses will never perish but have Eternal Life. However at some moment in time in the future, The LORD Ha Shem Yeshua The Messiah will return from Heaven with all His Saints, that is with all His Holy Ones, and He will establish His Kingdom on earth in Israel for one thousand years that will be like the Garden of Eden from the river of Egypt to the Euphrates River. And Messiah will be King over all the earth. And He will build His Temple in Jerusalem, and HE, THE LORD OUR GOD will reinstate the sacrifice for atonement. It is written in Scripture. (ZECHARIAH 14.20-21) Immediately after The LORD’S return, Messiah will build His Temple in Jerusalem and reestablish the animal sacrifice. But as previously stated, those who have Atonement in Messiah Yeshua WHO IS GOD ALMIGHTY, your Atonement is eternal and forever. Chapter 37 in the Book of Ezekiel teaches in Prophesy about the dry bones, the future resurrection of many Jewish People that will take place at The LORD’S return. And The LORD THEIR GOD, YESHUA THE MESSIAH will bring His resurrected Jewish People into the Land of Israel at the beginning of GOD’S Kingdom on earth in Israel, the one thousand year Millennium. And Ezekiel 38 and 39 Prophesy that the armies of the world will battle Israel at some time in the future. But in a moment, The LORD GOD OF ISRAEL, HA SHEM YESHUA THE MESSIAH will destroy those enemies of Israel and save His Jewish People. And Ezekiel Chapters 40 through 48 teach in Prophesy of the future rebuilding of the Temple in Jerusalem in The Kingdom of GOD on earth that will be like the Garden of Eden. And Messiah Yeshua will be King over all the earth. And the worship service, and the sacrifice of animals will be reestablished in the Kingdom because THE WORD OF GOD STANDS FOREVER. AND THE WORD OF GOD IS THIS. When there is a Temple in Jerusalem there will be a Priesthood and the animal sacrifice. ISAIAH 40.8, 1 PETER 1.23-25, DEUTERONOMY 12.27-28, LEVITICUS 3.1, ETC. Some of this Biblical information might be new for you. The Kingdom will be filled with joy and peace and be full of the knowledge of The LORD as the waters cover the sea. Eternal life will reign for most. And your Atonement in Messiah Yeshua is forever. And The LORD YOUR GOD, HA SHEM YESHUA THE MESSIAH will dwell among you Face to face. And you will bless His Holy Name forever. And there will be everlasting peace and joy. No sin, and no curse will be in the Kingdom. And the sacrifice of animals will take place at the Temple as in the days of the Tabernacle of the Congregation, and the First and Second Temples. So we will take certain passages from Ezekiel 40-48 that mostly address the animal sacrifice, and why there will be animal sacrifices. EZEKIEL 40.1-5 These Words are Prophesy that GOD gave to Ezekiel in a vision about the Temple in Jerusalem that will be built in the Kingdom of GOD on earth during the one thousand year Millennium at Messiah’s return. EZEKIEL 40.38-42 The burnt offering, along with the sin offering and the trespass offering are sacrifices for atonement. And they will continue for one thousand years. EZEKIEL 40.46-47 The Priesthood will be reinstated. They will perform the duties of the sacrifice on the altar that will be before the Temple in the courtyard that will be 167 feet square. Zadok will be the High Priest along with his sons. Zadok was the High Priest during the days of King David. And Ezekiel 48.11 reads that the sons of Zadok kept the charge of The LORD, and did not go astray when the Children of Israel went astray as did the Levites go astray. Zadok descends from Eleazar the son of Aaron. EZEKIEL 41.4 GOD showed Ezekiel the Holy Of Holies in the vision inside the Temple that will measure 33 1/2 feet by 33 1/2 feet. EZEKIEL 42.13 The Priests will eat the most holy things that are the meat of the animal sacrifices in special and holy rooms that will face the main Temple building. EZEKIEL 43.4-9 The Jewish People who are the Children of Israel will no longer defile the Holy Name of The LORD THEIR GOD Who will live among His People forever. Keep in mind, that according to many prophesies, The LORD GOD will bring huge numbers of Jewish People into The Kingdom who do not know their Messiah Yeshua. Who do not have Atonement in their Messiah Yeshua. And for the most part did not live their life for The GOD of Israel, nor did they follow Torah, The Law of Moses. And they will need atonement. And their atonement will be accepted by GOD made from the animal sacrifice. And along with their atonement, they will be taught to follow Torah, The Law of Moses. EZEKIEL 37.11-14, 21, DEUTERONOMY 30.1-5, JEREMIAH 16.15, JEREMIAH 23.3-8, JEREMIAH 31.7-11, 16, ZEPHANIAH 3.14-20, ETC. EZEKIEL 43.18-27 Again, the sacrifice will be reestablished in The Millennium, in The Kingdom of GOD on earth for the sinner who never had Atonement in The Messiah Yeshua, or even before The Messiah Yeshua. EZEKIEL 44.15-16, 23-24 The sons of Zadok, the Priests, and the Levites will teach Torah, GOD’S Eternal Law of Moses to the People. EZEKIEL 45.15 HERE IS THE REASON FOR THE ANIMAL SACRIFICE. Messiah Yeshua came 2,000 years ago to be our atonement. That was His mission. When Messiah Yeshua returns, His mission will not be to give atonement to sinners. But His mission will be to deliver Israel from all Her enemies, restore the glories of Israel’s former golden age, and inaugurate the ingathering of Israel, and GOD’S Kingdom of Righteousness and Peace. And that He will do, and more. Much more. EZEKIEL 47.21-23 All the non-Jewish People in The Kingdom will be as born in Israel among the Jewish People. And they will have inheritance among the tribes of Israel. In the tribe that the non-Jewish person chooses to live, there shall their inheritance be, saith The LORD. So why will The LORD GOD reinstate the animal sacrifice in the future Kingdom of GOD on earth during the one thousand year Millennium? Because GOD’S Word in The Bible Whose Word includes His Law of Moses stands forever. It never changes, nor does it end. Bible teachers should take that to heart when they teach the lie that Jesus fulfilled and abolished the Law of Moses, or the Law of Moses is only for Jewish People and no one else. That is a lie and dangerous for salvation. The animal sacrifice will make reconciliation for the sinner with THE LORD THEIR GOD by receiving atonement for the forgiveness of their sins. And then as today, they will be required to follow GOD’S Law of Moses. The Law of Moses consists only of GOD’S Laws, Statutes, Judgments, Teachings and Instructions. And those who have received The Messiah Yeshua and live by Torah, GOD’S Eternal Law of Moses, the animal sacrifice does not concern you. Your Atonement in Messiah Yeshua is eternal and forever. The animal sacrifice is not for you. Messiah Yeshua fulfilled His mission for His first coming 2,000 years ago when He gave His Life and shed His blood for our Atonement. At Messiah Yeshua’s second coming, His mission will Not be to bring atonement, but to destroy all the enemies of the Jewish People, and to save the Jewish People and their Homeland Israel. And establish The Kingdom of GOD on earth for one thousand years. And Reign as King over all the earth. And return the borders of Israel from the river of Egypt to the Euphrates River. And inaugurate the ingathering of the Jewish People and their children and their children’s children to dwell in The Land of Israel that the LORD OUR GOD has given to His Jewish People for an everlasting possession. To make the Land of Israel like the Garden of Eden, with no curse, and no sin. And bring in everlasting joy and gladness, and thanksgiving and the voice of melody, and peace forever and ever. And sorrow and sighing will flee away. YESHUA THE MESSIAH IS THE HOLY ONE OF ISRAEL, HA SHEM, GOD ALMIGHTY, THE KING OF ISRAEL. Posted on February 21, 2016 February 23, 2016 Categories Shabbat MessageLeave a comment on WHY WILL GOD REINSTATE THE ANIMAL SACRIFICE IN THE ONE THOUSAND YEAR MILLENNIUM DURING THE DAYS OF THE KINGDOM OF GOD ON EARTH IN ISRAEL? Shalom. Our teaching this morning will continue from Torah, The Law of Moses. The verses of study are Numbers 6.22-27. And the title of our message is, THE LORD BLESS YOU, AND KEEP YOU. And with that said, let’s read Numbers 6.22-27. This is such a beautiful blessing from The LORD. But what makes this blessing, and all GOD’s blessings so special is that GOD directs this blessing solely to the Children of Israel, who are the Jewish People, and to an exclusive and select group of non-Jewish People. And not to everybody. Because the Love of GOD, and the Blessings of GOD are NOT unconditional. The Love of GOD, and the Blessings of GOD ARE conditional. Conditional upon certain requirements of GOD. Let’s look at Verses 22-24. And The LORD spoke to Moses, saying, Speak to Aaron and to his sons saying, In this way you shall bless the Children of Israel, saying to them, The LORD bless you and keep you, The LORD make His Face shine upon you, and be gracious to you. etc. The Children of Israel are the Jewish People. AND VERSE 27. And they shall put My Name upon the Children of Israel, and I will bless them. GOD chose The Jewish People to be a Holy People unto The LORD THEIR GOD. And GOD chose the Jewish People to be a special People to Himself. To be His witnesses and His servant to tell the world EVERYTHING about THE ONE GOD OF CREATION. Which the Jewish People have done by writing the entire Bible from Genesis through Revelation. When The GOD of Creation put His Name upon the Jewish People, and upon His exclusive and select non-Jewish People, GOD blessed His people with His entire Being. Everything that GOD is. His Love, His Blessings, His Omnipotent and Unlimited Power. His Glory, and Honor, and His Excellence. He has given us His Atonement and Salvation that we shall remain written in GOD’S Book of Life. BUT GOD’S LOVE AND HIS BLESSIINGS ARE NOT UNCONDITIONAL. GOD’S’ LOVE AND HIS BLESSIINGS ARE CONDITIONAL. GOD’S LOVE AND HIS BLESSINGS ARE CONDITIONAL UPON YOU FEARING GOD, TO WALK IN HIS WAYS, TO LOVE THE LORD YOUR GOD AND KEEP HIS LAWS, HIS TEACHINGS AND INSTRUCTIONS THAT ARE WRITTEN IN THE LAW OF MOSES. AND HAVING ATONEMENT IN THE JEWISH MESSIAH YESHUA FOR THE FORGIVENESS OF YOUR SINS. THOSE ARE GOD’S CONDITIONS FOR YOU TO HAVE HIS LOVE AND HIS BLESSING. AND THEN YOU WILL BE PART OF THAT SPECIAL AND SELECT GROUP OF PEOPLE WHO ARE HOLY TO THE LORD AND SPECIAL TO HIMSELF. Obedience to GOD is spelled out throughout The Bible. DEUTERONOMY 10.12-13 explains the obedience that GOD requires of you. Fear The LORD YOUR GOD, to walk in all His ways. Love Him, and serve The LORD your GOD with all your heart, and with all your soul. To keep the Commandments of The LORD, and His statutes that are collectively The Law of Moses. Which GOD commands you for your good. And The LORD YOUR GOD will bless you mightily. And Atonement is accomplished today only through the sacrificial death of the Jewish Messiah Yeshua. The Prophesy reads, He shall make His Soul (Messiah Yeshua’s Soul) an offering for sin, or He shall make His Soul (Messiah Yeshua’s Soul) a sacrifice for transgression. The Hebrew reads, EEM TAH’SHEEM, AH’SHAHM NAF’SHO. The conditions that GOD requires of you for His Love, and Blessings, and Salvation are belief in The Jewish Messiah Yeshua for Atonement, and obedience to His Laws, Teachings and Instructions that are written in The Law of Moses. Thus doing that which is Lawful and Right in the Sight of GOD. The Law of Moses contains ONLY GOD’S Laws, Statutes, Commandments, and Judgments. And His Teachings and Instructions. Messiah Yeshua, The Promised Jewish Messiah, will raise up the tribes of Israel and bring again the preserved of Israel TO THE LORD. It will be the Messiah Yeshua who will bring the Jewish People back to the LORD THEIR GOD. And GOD has given The Jewish Messiah Yeshua to the Gentiles, for a light, to teach the Gentiles about THE ONE GOD, and His Laws, Teachings, and Instructions that are written in The Law of Moses. And Messiah did that. And Messiah Yeshua is GOD’S Salvation to the end of the earth for all peoples. AND MESSIAH YESHUA IS THAT ONE GOD. Let’s look at more of GOD’S wonderful and great Blessings and Promises that are exclusively for you, if you do as GOD requires of you, along with your faith in Messiah Yeshua. EXODUS 15.26 The LORD YOUR GOD will give you good health, If you obey GOD’S Torah, His Law of Moses. EXODUS 19.5 The LORD YOUR GOD will make you a peculiar and special treasure to Him above all people, If you obey GOD’S Law, the Law of Moses. EXODUS 20.6 The Ten Commandments are part of The Law Of Moses. And in this Commandment, GOD says that He will show mercy to those who love Him, and keep His Commandments. All GOD’S Commandments are written in The Law of Moses. AND THE LAW OF MOSES CONTAINS ONLY GOD’S LAWS, COMMANDMENTS AND STATUTES. EXODUS 23.22 GOD will be an enemy to your enemies, and an adversary to your adversaries, If you will obey His Voice, and do all that He speaks. DEUTERONOMY 5.10 Again, part of The Ten Commandments. GOD shows mercy to the thousands of them who love Him. And they prove it by keeping His Commandments, The Law of Moses. DEUTERONOMY 7.9-15 GOD will love you, and bless you, and bless your children, and prosper you, If you obey His Commandments and Statutes that are written in The Law of Moses. DEUTERONOMY 11.26-28 The LORD YOUR GOD will bless you, IF you obey The Commandments of The LORD that are written in The Law of Moses. DEUTERONOMY 12.28 It will go well with you and your children after you forever If you do that which is good and right in the sight of The LORD YOUR GOD by obeying His Law of Moses, and every Word GOD speaks in The Bible. DEUTERONOMY 28.1-2 If you obey THE LORD YOUR GOD, and diligently obey His Voice, every Word He speaks in The Bible, GOD will set you on high above all the nations of the earth, and His blessings will come upon you, and overtake you, If you obey The Voice of The LORD YOUR GOD. DEUTERONOMY 28.9 The LORD will establish you a Holy Person, If you will keep the Commandments of The LORD that are written in The Law of Moses. JOSHUA 1.7-9 GOD will prosper you wherever you go, and give you good success. And The LORD will be with you wherever you go. If you obey His Law, The Law of Moses. 1 KINGS 2.1-3 Be strong, and show yourself a man or a woman by walking in GOD’S Ways, keeping His statutes and His Commandments, and His judgments, and Testimonies that are written in The Law of Moses. And GOD will prosper you in all that you do, wherever you go. 1 KINGS 3.14 GOD will give you long life If you keep His Statutes and Commandments that are written in The Law of Moses. JOB 36.11 Your days will be spent in prosperity and pleasure If you obey and serve The LORD YOUR GOD by obeying His Law of Moses. PSALM 1.1-6 Blessed is the man and blessed is the woman who delights in The Law of The LORD. You will be like a tree planted by the rivers of water that brings forth their fruit in their season. Its leaf will not wither, and whatsoever they do will prosper. For The LORD knows the way of the Righteous, but the way of the ungodly will perish. PROVERBS 3.1-2 Obey GOD’S Law. Let your heart keep His Commandments. And long life and peace will GOD add to you. PROVERBS 16.6-7 When your ways please The LORD by obeying Him, The LORD will make your enemies to be at peace with you. ISAIAH 1.19 You will eat the good of the land If you are willing and obedient to The LORD. ISAIAH 40.8 The Word of The LORD stands forever. GOD’S Word which is His Law never changes, nor does it end. And The Word of The LORD is Law, GOD’S Law that must be obeyed to be part of His Chosen and Special People. JEREMIAH 11.1-5 To be part of GOD’S People, Gentiles and Christians, you must obey GOD’S written Word in the Bible, and His Law of Moses that is written in the first five books of the Bible, along with your faith in The Messiah Yeshua. And GOD will be your GOD. And you will enter the Millennium in the Land of Israel, and have Eternal life in Heaven. LUKE 8.19-21 MESSIAH’S FAMILY ARE THOSE WHO HEAR THE WORD OF GOD, AND DO IT. ACTS 5.32 GOD ONLY GIVES HIS HOLY SPIRIT TO THOSE WHO OBEY HIS LAW OF MOSES, AND HAVE ATONEMENT IN THE MESSIAH YESHUA. So yes, there are conditions for GOD’S Love, and His Blessings, and for His Salvation. And GOD’S conditions are that you fear The LORD YOUR GOD, to walk in all His Ways. And to love The LORD YOUR GOD with all your heart, and with all your Soul. And proving it by obeying GOD’S Laws, Teachings, and Instructions that are written in The Law of Moses, along with your faith in Messiah Yeshua for Atonement of your sins. And GOD will be your GOD, and you will be His People in an exclusive and select family of The LORD. THE LAW OF THE NAZIRITE. Shalom. Our teaching this morning from Torah, The Law of Moses will be from Numbers Chapter 6. We will read the first eight verses but continue on in our teaching through Verse 21. And the Title of our message is, THE LAW OF THE NAZIRITE. And with that said, let’s read Numbers 6.1-8. NUMBERS 6.1-2 Both a man or woman are allowed to be Nazirites. Being a Nazirite is voluntary and not a Command of GOD. But when the person chooses to be a Nazirite, there are certain Laws that The LORD sets forth while they are Nazirites. Nazirite in Hebrew is NAH’ZEER Meaning separate, consecrated, and one who abstains. Consecrated means set apart for The LORD, and dedicated to The LORD. Thus the Nazirite accomplishes a greater closeness to The LORD OUR GOD. When an individual, either a man or a woman speaks a vow, the vow of a Nazirite to separate and consecrate themselves to The LORD, GOD has certain Laws that must be followed. If, or when the person violates any of those Laws, their Naziriteship is complete and ended. Or if the person voluntarily decides to end their Naziriteship, their Naziriteship is completed. And the Nazirite must also continue to follow The Law of Moses. The following six Verses spell out the distinct Laws that The LORD GOD requires the Nazirite to follow, in addition to his observance of Torah, the Law of Moses. NUMBERS 6.3-4 The Nazirite must separate themselves from wine and strong drink. They are not allowed to drink any vinegar of wine, or vinegar of strong drink. Nor are they allowed to drink any liquor of grapes, or eat fresh grapes or dry grapes. They are not to eat anything made of the grape or the husk. The husk is the skin of the grape. More laws for the Nazirite are written in NUMBERS 6.5. The Nazirite is not allowed to cut his or her hair until the days of their Naziriteship is completed. And that person must be Holy. And again The LORD repeats that they must let their hair grow long without cutting it. NUMBERS 6.6-7 All the days that the Nazirite has separated themselves to The LORD, they are not allowed to come near a dead body. Nor shall they make themselves unclean by coming near the dead body of their father, or their mother, their brother or sister. Because the consecration of his GOD is upon his head. I believe the meaning that The consecration of his GOD is upon his head, means that the Nazirite is responsible to follow all the Laws of the Nazirite, being Holy to The LORD. NUMBERS 6.8 All the days of their Naziriteship, separated and consecrated to The LORD, the Nazirite is Holy to The LORD. So the Laws that the Nazirite is required to follow according to the Commandment of The LORD THEIR GOD are, They must abstain from wine and strong drink. They are not allowed to drink any vinegar of wine, or vinegar of strong drink. Nor shall they drink any liquor of grapes, nor eat fresh or dry grapes. They are not allowed to eat anything that is made of the grapevine, or from pressed grapes, or the skin of the grape. They are not allowed to cut their hair until the days of their Naziriteship are complete. They are not allowed to come near a dead body, even the dead body of their father, mother, brother, or sister all the days of their Naziriteship. And they are Holy to The LORD. Thus the vow of the Nazirite brings the man or the woman closer to The LORD THEIR GOD than usual. Now, there is no problem in understanding what it means not to eat certain foods, or not to drink certain drinks. Or letting your hair grow long without cutting it. Or not coming near a dead body, even the dead body of ones father, mother, brother, or sister. BUT WHAT DOES IT MEAN TO BE HOLY TO THE LORD? Let’s look at VERSE 5. He or she shall be Holy. And VERSE 8. All the days of their separation, they are Holy to The LORD. SO WHAT DOES IT MEAN TO BE HOLY TO THE LORD? The Hebrew word for Holy is KAHDOSH. And remember, sin is breaking the Law of Moses, 1 John.3.4. And to be pure and clean from sin and dedicated to The LORD YOUR GOD can only be accomplished in one way. Having your sins atoned for in The Messiah Yeshua, and for you to live your life according to GOD’S LAWS that are written in The Law of Moses in the first five books of The Bible. EVERY LAW THAT IS WRITTEN IN THE LAW OF MOSES IS GOD’S SPOKEN LAW. EVERY ONE. AND LAWS ARE MADE TO BE OBEYED. Not only are Nazirites who serve GOD Holy, all who serve The LORD must be Holy. Because The LORD says, You shall be Holy for I The LORD YOUR GOD am Holy. Being Holy to The LORD YOUR GOD is having Atonement in The Messiah Yeshua, and diligently obeying all GOD’S Laws that are written in The Law of Moses. EVERY LAW, STATUTE, AND COMMANDMENT, EVERY TEACHING AND INSTRUCTION THAT IS WRITTEN IN THE LAW OF MOSES COMES FROM THE MOUTH OF GOD ALMIGHTY. AND GOD ALMIGHTY IS HA SHEM YESHUA THE MESSIAH. GOD’S Commandments are the entire Law of Moses. Whether a person is Jewish or Christian, or any other religion, being Holy to The LORD GOD OF CREATION is one and the same. Having Atonement for your sins through faith in MESSIAH YESHUA, THE GOD OF CREATION, and living according to GOD’S Law of Moses. And it is GOD, Yeshua The Messiah Who gave His Laws to Moses Face to face for you and me to obey in order to be pure and clean from our sins, to be dedicated to The LORD OUR GOD. Thus it is impossible to be Holy when one does not have Atonement in Messiah Yeshua, and does not obey Torah, The Law of Moses that is written in Genesis, Exodus, Leviticus, Numbers, and Deuteronomy. (Acts 21.24) Paul obeyed Torah, The Law of Moses. Anyone who believes Paul abolished The Law of Moses is wrong. Today, without the Temple, Priesthood, and sacrifice, I believe that any individual may take on the vow of a Nazirite by doing all that is commanded of GOD in this Chapter, along with their faith in Messiah Yeshua for Atonement, and a life that is Holy by living according to Torah, GOD’S Law of Moses. And remember what being Holy to The LORD means. Having Atonement in The Messiah Yeshua, and being dedicated to The LORD YOUR GOD by diligently obeying His Law of Moses. Being pure and clean from sin is only accomplished by living according to every one of GOD’S Laws that are written in The Law of Moses. AND THE LAW OF MOSES CONTAINS ONLY GOD’S LAWS. So in conclusion, being Holy to The LORD YOUR GOD, and having faith in The Messiah Yeshua lead to the greatest of blessings, and eternal life in Heaven. Posted on February 7, 2016 February 15, 2016 Categories Shabbat MessageLeave a comment on THE LAW OF THE NAZIRITE.